Villa Suriyawatta is a vacation complex composed of three pavilions – all highlighting classic rustic comfort. Minimalist and spacious interiors are appointed with mostly well- crafted timber wood furnishings and fixtures, as well as elaborate and contemporary, lavish pieces. Amenities are expectedly of hotel and resort standard – to guarantee sheer guest satisfaction and leisure. Erected on a slope elevated from the beach, Villa Suriyawatta gives you a highland getaway with a truly countryside and homey charm. The villa has five air-conditioned bedrooms. Four of these are in the main pavilion. Two of these bedrooms have draped, king-sized beds. Two other bedrooms have twin beds. The fifth bedroom, in a detached pavilion has twin beds and can be pushed together to make a double. All bedrooms have dedicated bathrooms with rain showers. Although two of these bathrooms also have fitted, natural stone bathtubs. On the expansive garden’s middle terrace is the 15-meter swimming pool. After your morning swim in the sea, leap into its crystal clear, salt waters and continue to wallow in your favorite element. 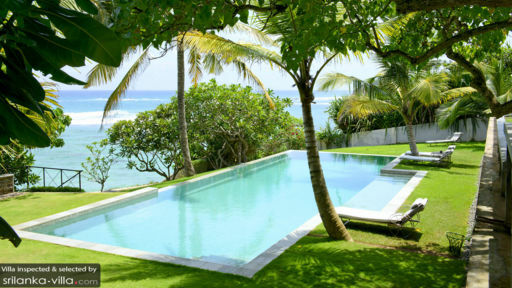 Out of the water, you can laze on cushioned pool beds under the shade of palm trees on the well-kept lawn. 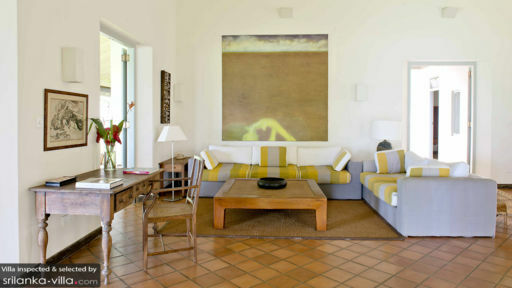 At the villa’s spacious, airy and high-ceilinged main pavilion is the living area with its hefty and long sofas. Here, you can all hang out for lively interaction. At the covered terrace that looks out to the garden is the alfresco dining area. On its long, timber wood table for 10, you can all relish authentic Sri-Lankan cuisine – as well as your most requested comfort food – meticulously put together by the onsite chef at the villa’s fully-equipped, modern kitchen in another pavilion. Assigned to attend to the villa’s daily services is a staff made up of a gardener as well as housekeepers and security personnel. Aside from the chef, a babysitter, a laundry helper and a spa therapist may be called in upon your request. Their services will be charged separately however. Car rental is also available. 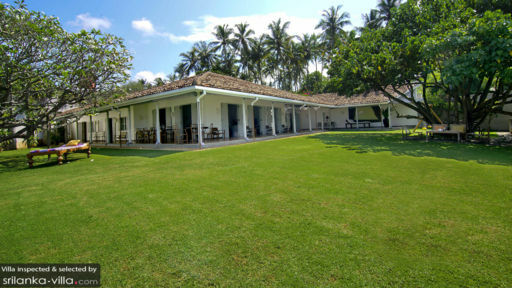 Villa Suriyawatta is located in Weligama. Sail to Taprobane Island and walk through the villa and gardens of the exiled French Count De Mauny. On another occasion, go sightseeing around town particularly at the Leper King Statue and at Aggrabodhi Vihara – an ancient temple established in the 3rd century BC. The villa is amazing. So much attention to design, detail and finishing that you don't typically see in Sri Lanka. Very well thought out and lots of effort Also, the beach that adjoins the property is really nice, but you don't really appreciate it from the pictures. The staff and cooking are great. My family and I didn't leave the villa for the entire 7 days! We had a fantastic time at Villa Suriyawatta. From the decor, to the fantastic location with front beach access, to the delicious food prepared by Darminda, everything was just perfect. Kudos to the staff who was always extremely attentive, Asanka is a star. We will definitely recommend this villa to our friends, and will hopefully come back.